Pizza is one of the millions Italian dishes specialties; Can you eat a real Italian Pizza outside the beautiful Mediterranean peninsula? Naples Pizza, “the original” with soft thick crust. Roman Pizza, crusty and thin. Pizza with buffalo mozzarella and Pizza with cow milk mozzarella. Pizza with tomato sauce or with fresh cherry tomato or without tomato(usually in Italy called “Bianca”). You can put a lot of toppings on your pizza but the original one is the “Margherita” a Naples pizza with buffalo mozzarella, tomato and basil, created in the 1889 as a gift for the Queen Margherita during her visit to Naples. 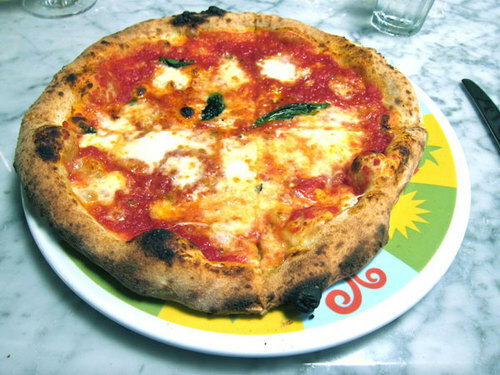 – Keste’ (Bleecker street) : Delicious Naples Pizza, the best in town. to plan a big line outside before tasting their good dishes. easy to find in Manhattan); you can also reserve your table. a poor service and no reservation are available. restaurant but you can eat “margherita” with 5$. Otto Pizzeria (the worst pizza in my life),Grimaldi, Patsy, John’s, Lombardi, Totonno’s and all others aren’t Italian pizzeria; the tomato sauce is like ketchup, cheese doesn’t taste cheese and the crust is like plastic bag.